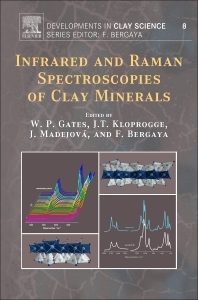 Infrared and Raman Spectroscopies of Clay Minerals, Volume 8 in the Developments in Clay Science series, is an up-to-date overview of spectroscopic techniques used in the study of clay minerals. The methods include infrared spectroscopy, covering near-IR (NIR), mid-IR (MIR), far-IR (FIR) and IR emission spectroscopy (IES), as well as FT-Raman spectroscopy and Raman microscopy. This book complements the succinct introductions to these methods described in the original Handbook of Clay Science (Volumes 1, 1st Edition and 5B, 2nd Edition), offering greater depth and featuring the most important literature since the development and application of these techniques in clay science. No other book covers such a wide variety of vibrational spectroscopic techniques in a single volume for clay and soil scientists. Will P. Gates, PhD, is a Senior Research Fellow at the Institute for Frontier Materials, Deakin University, Victoria, Australia. He received his PhD in Clay Mineralogy and Soil Physical Chemistry at the University of Illinois, Urbana-Champaign, Illinois, USA in 1994, and MSc at New Mexico State University, Las Cruces, New Mexico, USA in 1987 and a BSc at Montana State University, Montana, USA. He joined the CSIRO (Adelaida, South Australia, Australia) as a Senior Research Scientist in 1997 and since that time has applied a variety of spectroscopic tools, clay mineralogy and physical chemistry to the study and application of bentonites and bentonite products in the waste (containment and reuse), chemicals (synthesis, green chemistry), mining (barriers, tailings dewatering and water reuse), agricultural and mineral exploration industries. He was recipient of the Marion L., and Christie M. Jackson Mid Career Clay Science Award by The Clay Minerals Society, Chantilly, Virginia, USA. J. Theo Kloprogge, MSc Geology, PhD Geology/Chemistry, is an Honorary Senior Fellow, at School of Earth and Environmental Sciences, University of Queensland, Australia, and Adjunct Professor at the Department of Chemistry, College of Arts and Sciences, University of the Philippines Visayas, Philippines. He is the Editor/Author of CMS Workshop Lectures Volume 13 – The Application of Vibrational Spectroscopy to Clay Minerals and Layered Double Hydroxides. During the past 25+ years Dr. Kloprogge has been working as a mineralogist and spectroscopist. The results of this work have been published in more than 250 papers in international peer reviewed journals as well as in a number of book chapters. He has been collecting minerals for more than 40 years and has built an extensive collection both for research and private use.